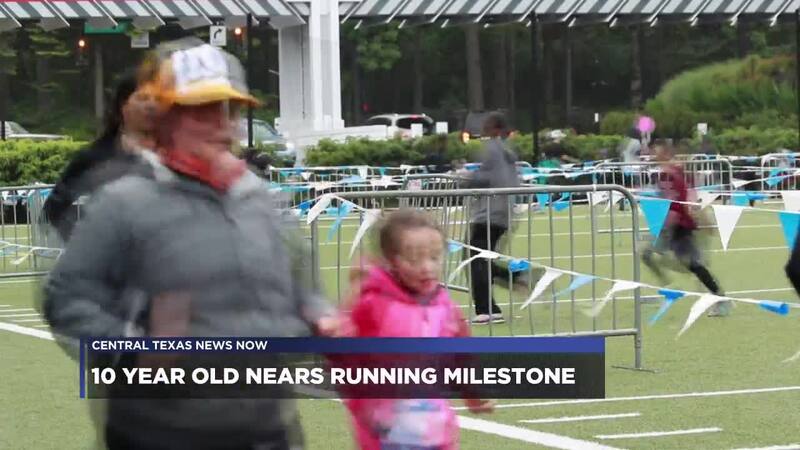 COPPERAS COVE, TX — Kelbie Black, a 10-year-old fifth grader from Taylor Creek Elementary School, just became the highest achieving mileage runner in the national running group "Marathon Kids." Marathon Kids prides themselves on their mission statement of, "through running, we show kids they can achieve more than they ever thought possible and put them on the path to healthier lives." "I never thought I could reach it but just out of three years I'm like 'whoa,'" said Kelbie. Keblie ran her 1,000 mile the morning of April 15 2019, an achievement three years in the making. Her family explained that her found talent and joy for running has made her more self assured than ever. "She's just become extremely confident. She's learning to preserve and push through, when its hard she sees benefits, she can look back on past success and know even though its difficult I can keep going," said Kyle Black, Kelbie's father. Her father is the PE teacher at her elementary school. He brought the program to the school three years ago all in the hopes to instill more camaraderie into his young students. "A positive change that everyone has something in common which is Marathon Kids, so from the youngest to the oldest there's something for them to talk about," said Black. As for Kelbie's future goals she explained she's just having fun, and she might pursue running in high school.